We are in Constantinople, in 384 AD. There is a festive event taking place: the wedding of two well-known youths of that time. They are both from upper class families. The bride, Olympiatha, is a remarkable young lady, quite wealthy and a descendant of the imperial family. She is an orphan whose uncle Prokopios (an eparch of the Imperial State that is also her protector) undertook the responsibility for all of the wedding arrangements, including the invitation list. Olympiatha is marrying a wonderful man by the name of Nevrithios who is the eparch of Constantinople and overseer of the imperial fields. According to the historians of that time, all of the “who is who” are in attendance of the wedding ceremony, including a sizeable group of bishops. 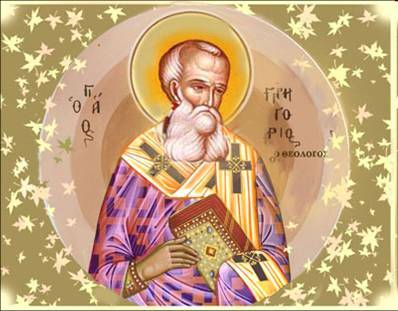 St. Gregory the Theologian (the Patriarch of Constantinople and spiritual father of the bride) is unable to be present due to personal illness. He sent a personal letter to Prokopios expressing his regrets for being unable to attend due to illness. As the spiritual father of Olympiatha, he is pleased about the wedding and passes in writing his immense joy about the wedding of the “golden Olympiatha.” He calls her golden not because of her immense family wealth but rather her golden heart that is evident in the bride’s character and demeanor. In his letter, St. Gregory refers to her as “my child,” i.e., my spiritual child; as such, he is in position to know the depth of her character and quality of her soul as no one else. Later on, St. Gregory sends to the young bride an original wedding gift: a poem with 111 verses, written in ancient Greek and with quite old-fashioned language (even for that time). Through this gift, he passes to his spiritual daughter the wisdom of pertinent advice and thus paints the ideal type of an Orthodox Christian wife. For your wedding, I, your spiritual father Gregory, offer you this poem as a gift. And I consider it to be the best possible advice a father could offer to his beloved daughter. Listen to me Olympiatha: I know that you desire to be a true Christian. As such, be aware that a true Christian must not only be one but she must also appear accordingly. This is why I ask you to pay special attention towards your personal appearance. You must be simple! Gold, attached to precious stones, does not add any value to women of your stature. This is even more so with make-up. It is very improper for you to alter your face, which represents an image of God, for the sole purpose of attraction and admiration by others. Know that this constitutes vanity that is unbecoming of a young lady of your character. I therefore ask that you overcome the feminine vanity that is abundant among young ladies of our time and remain simple in your appearance. The expensive and fancy dresses must remain for those women that have no desire for the life beyond and do not know what the meaning of spiritual struggle and attainment of virtues is all about; this type of woman cannot possibly comprehend the spiritual radiance and brilliance of a life in Christ. You have aimed towards greater goals and for a higher purpose for your life. These goals demands your full and undivided attentiveness and care. First of all, you must respect and love God and immediately after Him you must respect and love your husband in the same manner as our Lord and Savior and in accordance with the instructions of our Holy Gospel. I thus ask you, how is it possible for a woman to love her husband in this manner if she has not met, has not respected and has not loved Her Lord and Creator in this same manner? In your marriage, fondness, affection and love must be strong and persistent for him whom God has selected to be your life partner. This man is now the eye of your life and the delight of your heart. And if you ever perceive that your husband possibly loves you more than you love him, do not take advantage of his feeling by attempting to gain the upper had in your marriage. That is plainly wrong as it is totally against the writings of the Holy Gospel! You must respect him and love him unconditionally, as you love God. Be aware that you are a woman and you have an important and great purpose and destiny; however, your purpose and destiny is different than that of your husband who must be the head of your household. Set aside the silliness of equality among the sexes, that some of your contemporaries preach, and attempt to comprehend the obligations of marriage. In the realization of these obligations you will discover the great patience and endurance that is necessary to fulfill your family duties; it is in this manner that you will also discover the great strength that you as a woman possess. You must surely be aware of how easily anger overtakes men. They cannot maintain and they often appear as wild lions. It is at this exact moment that a woman must remain stronger and display her superiority. You must play the role of the lion-tamer. What does a lion-tamer do when the beast starts roaring? He becomes even calmer than usual and through kindness and persistence he overcomes his wrath. He speaks to him kindly, in a soft but firm voice, he caresses it, he attends to it, he pets it and little by little calmness is restored. You must never criticize, scold or become derogatory towards your husband for something that he has erred. Likewise, you must avoid any contempt towards any inaction or indecision by your husband, even when the outcome is not favorable or something that you greatly desire or consider proper. Be aware that demons are always around attempting to penetrate your household, and break up the couple’s harmonious spiritual cohabitation. You must share everything, joys and sorrows alike. The Holy Sacrament of Marriage has indeed made all common to both of you. This is equally important towards the daily obligations and duties as they apply to running the household; it is the only way that a strong foundation will be built for your marriage. Let both of you provide your views and opinions; in the end, however, allow your husband to have the final say. When you observe your husband to be sorrowful, share in his sorrow and provide him the needed relief; the support of the person closest to you in moments of sorrow and despair is of great value and relief. Immediately, however, let your facial expressions become calm, clear and collected; let peace prevail upon your demeanor and forego the temptation of any thoughts of despair. The wife is the calm harbor for the sea wave-stricken husband. Be extremely careful with whom you associate and the company that you keep. Be especially careful of the social gatherings that you may be participating in. Do not allow yourself to enter entertainment centers of questionable background; these represent extreme danger towards your purity and the sanctity of your marriage. These types of social interactions remove the instinct of shame, eyes cross with eyes, and once shame is not there to guard from any impropriety, the demons are able to exercise their influence and give rise to evils of unspeakable magnitude. On the other hand, social interactions with friends of substance and of firmly grounded spiritual state must be pursued. In this manner, words of value get implanted within you and you either benefit from them or are able to confront and resolve any weaknesses that you may recognize. Concurrently, you are able to cultivate social interests and get to know people who will benefit your household’s spiritual state. Do not be anxious to keep company or even appear in public and in the company of others for no reason. You should instead dedicate your precious time in the company of your wiser and more prudent relatives, priests, and seriously-minded people, young and old alike. Stay away from conceited and ostentatious women whose mind is pre-occupied with external appearances and social circles, all for the purpose of vainglory and public display. This should be the same for any men that you consider respectful and spiritual but whom your husband has not allowed to enter your home, irrespective of how highly you may regard them. For is there anything more precious for you than your good husband whom you love so dearly? Your thoughts must aim high but you must never behave as intolerable or snobbish. I applaud women that are known by only a few men. Do not run towards worldly feasts and celebrations, even when those are for weddings or birthdays. It is around those types of gatherings that the passions of the flesh are aroused with the many dances, the drinking, the laughter and the false joys that are capable of deceiving and misleading even the pure and the wise. Always remember that purity is extremely fragile—it is like bee wax exposed to the rays of the sun. It would be prudent to limit and at times avoid the worldly feasts, even within the confines of your own home. If we were capable of controlling the desires and many appetites of the stomach we would be well served in our struggles against the many passions of our flesh; we would be in a position to conquer them instead of being subdued by them. Keep your face calm and collected and do not alter it with extreme laughter or with grimaces of dismay, anger or disappointment towards others. Your ears should be decorated not with pearls but instead with the sounds of proper language and with locks for all the improprieties that may enter your nous through them. Thus, whether they are open or closed your sense of hearing will remain pure. As far as your eyes, they are the ones that display the contents of your soul. Let them be the source of blush and virgin purity that pours below your eye lashes. This way, your presence and eyesight will invoke modesty, decency and the shame of innocence to all that lay their eyes upon you, perhaps even your husband! It is best and for many reasons that you keep your eyes closed or indifferent to the events around you and you should make it a habit to always maintain your sight low. And now for your tongue. Your husband will always be your enemy for as long as your tongue is uncontrolled, even if you are to be blessed with thousands of other talents. A foolish tongue often endangers even the most innocent of people. It is preferred to maintain quiet, even in cases that you are correct. This is because you risk the expression of an unintended improper word or characterization. No matter how greatly you desire to say a lot, it is best that you limit your words and instead choose your presence to be a quiet one. Be attentive even of the manner that you walk; it matters greatly towards a prudent presence. And now pay close attention and be mindful of the following advice: You must never exemplify or maintain an uncontrollable desire for the flesh. Persuade your husband to respect the holy days of the Church and the fasting periods. This is because God’s laws are of much greater importance than the image of God. Be mindful that the institution of marriage was established by the Son of God to aid His creation so that a balance is maintained, as some depart this world while others arrive. If you have benefited from this old man through some spiritual words of value I ask that you keep these words and advice guarded well within the depths of your soul. In this manner, through everything that you have benefitted and through the grace of your moral stature, you will be capable of healing your excellent husband and well known politician from the evils of vainglory and pride that constantly surround him. This is my gift and heirloom that I offer to you. And if you desire my blessing, I pray that you become a vineyard of descendants, with many children, and many children from these children, so that our God may be glorified by more of us, for it is for Him that we are born and to Him that we should aim our earthly paths.